Join us for live quilting chat with friends on November 10 from 7-8:30pm US Eastern! Join us Oct 13 from 7-8:30pm US Eastern for the virtual stitch-in! 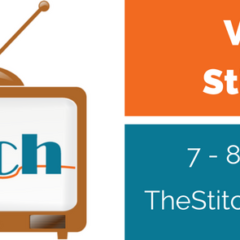 Join us tonight from 7-8:30pm for our virtual stitch-in! Join us for our monthly virtual stitch-in! July 14 from 7-8:30pm US Eastern time zone. It’s time for the monthly virtual stitch-in!